On Monday, we made a small vat of Wensleydale with our new cow milk supplier’s milk and at the same time took a cheese making course with Tina. Tuesday was a mad waxing day with Stu and I waxing like crazy, having put the smoker on twice. We smoke our own cheese, using oak chippings from Theakston’s brewery. On Wednesday, we made a 1,900 litre vat of Superior Goat Gouda and on Thursday a 1,900 litre vat of Original Goat. Thursday was a catch up day for me doing paperwork, except that I went to Blackburn and got our scales calibrated with Auto Scales and then on to Brytec, our equipment suppliers for a coffee, gossip and forage. And on Friday, we both took a half day after vac packing and cleaning down the dairy after a Superior Goat Gouda make. On Monday, first we knocked out 100 pots of Original Goat and vac packed and washed up. 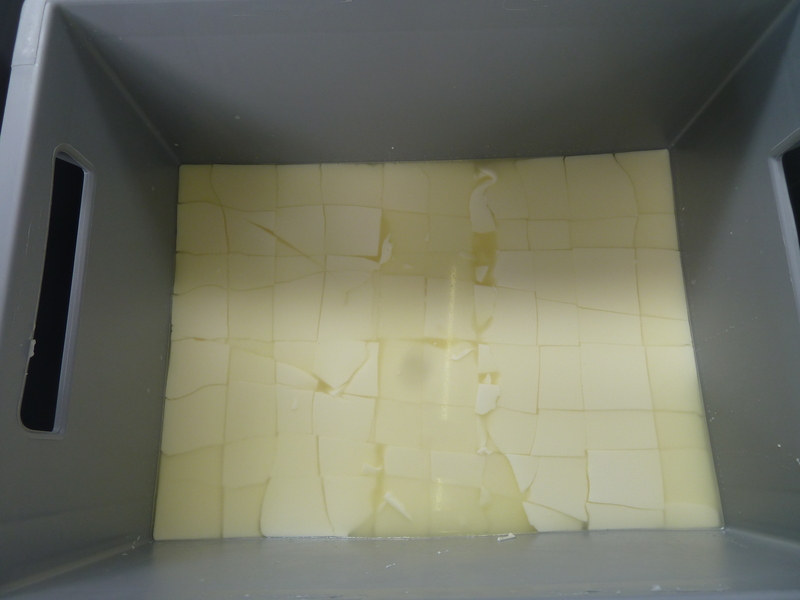 Stu sanitised every single pot that we have in the dairy and cleaned the IBCs to within an inch of their life. After this, as we were not making cheese, we digressed and spent the rest of the day doing a jolly good clean and tidy; miscreant cobwebs were swept in the eaves, walls cleaned down. As we are both getting on a bit, we just can’t remember what else we did on Monday and that was this week! On Tuesday, I made an emergency dash home to meet the oil boiler man whom I had hoped would fix the boiler as I have had no hot water or heating at home for about a month now, only he couldn’t fix it. Stu cleaned the drains in the dairy as we had no cheese in the press and had a big dairy day which culminated in spraying hypo around so that our dairy smelled like a municipal swimming pool. When I came back after my abortive trip home we finished off cleaning and tidying in the wholesale side. Wednesday there was a rash of small orders which took me all morning whilst Stu and Andrew made a vat of Superior Goat Gouda and Thursday they made a vat of Original Goat whilst I put together some more orders. Friday, today, Stu has been cleaning up the small wax bath that we use to wax our Yorkshire Bowlers. I liaised about our next whey pick up, spoke to a couple of customers, did some debt collection and tried to sort out a delivery for a customer in Somerset whose courier has let him down. 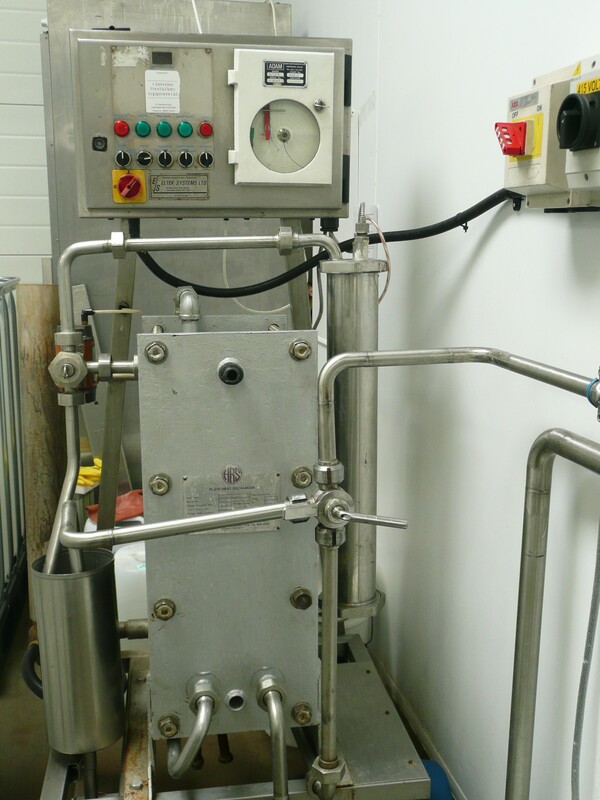 I commissioned a new piece of kit to make our new mystery cheese in from Brytec and received a call to say that it is almost completed which is great! Went to the dentist and had copious amounts of blood taken by Miriam the nurse aka The Brute who calls me a wimp when I say that the Vitamin B12 injection hurts, (I admit it and it does hurt) actually, I like Miriam, but she is will always be The Brute when she takes blood and gives me jabs, apart from that, she is lovely!